The Templates Factory is a great place to find website, flash, logo, osCommerce, corprate and swish template designs. 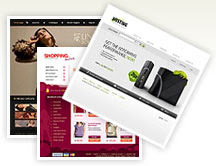 Here you will find very high quality and professional designs at very good prices. The great part about the Templates Factory is that you can browse through the thousands of templates until you find what you are looking for and once you find one there is a customize button for making any minor changes to the design which makes your template unique from any other. The website templates start from as little as $50 with a great selection to choose from, you are sure to find one to fit your needs and as already said before, there is also a customize button to just tweak the style a little more. The Templates Factory also provide some excellent flash templates that really would impress your visitors, these are some of the best flash templates available on the web and again they are available at great prices. If you are looking at setting up a business and want to save time and money then you should check out the collection of osComerce templates here which will allow you to focus on all the other important things required to run a buisiness. At the Templates Factory you can also get a custom logo designed, you choose the basic look of the logo from a selection of hundreds and then you simply make the requests as to what you would like changed, the logo's start from as little as $11 so if that is not value for money then what is?